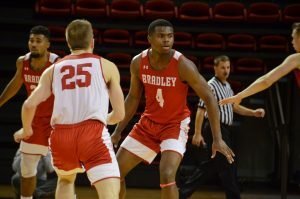 Athletes today rarely get into the news for anything academically but poor performances in the classroom, Bradley senior basketball player Dodie Dunson is one of those few. Dunson’s path to wearing a Bradley uniform may have never happened if he hadn’t been diagnosed with a severe form of dyslexia. “Because of my learning disability they (Bradley) had a program in place for me, and I thought Bradley was the best fit for me academically and basketball wise,” Dunson said. 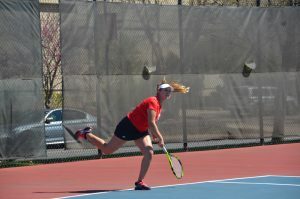 The Bloomington native was a star in high school, receiving first team all-state honors as a senior in 2005. After high school, Dunson attended Brewster Academy in New Hampshire before committing to Iowa State before the 2006-07 season. Dunson eventually transferred to a junior college, Vincennes University in Indiana, after only one season at Iowa State. The 6’3” guard averaged over ten points per game in his one year at Vincennes and landed in Peoria prior to his junior year in 2008. 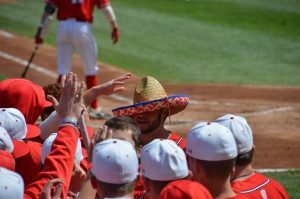 He has thrived at Bradley earning a 3.5 GPA in his first semester on campus and a 4.0 during the 2009 and 2010 spring semesters. Dunson refuses to let his learning disability interfere with his grades in the classroom. Dunson’s commitment to academic excellence, his play on the court and infectious personality has made him one of 30 candidates for the Lowe’s Senior CLASS Award prior to the 2009-10 season. But just two games into the year, Dunson suffered two broken bones in his left forearm, sidelining him for the rest of the season. Dunson was granted a medical hardship waiver, earning him one last season on the Hilltop, and he has again been nominated for the Lowe’s Senior CLASS Award. Dunson is not only a great student but also a tremendous asset to the basketball team. His defense and leadership make him a standout on the court. Dunson is also known as the team jokester. In his last season as a Brave, Dunson wants to go out on top.